The following thoughts on using sound reinforcement for a big band don’t really go into the equipment itself, but rather just summarize my personal philosophy about how to effectively use sound reinforcement with a big band. I will be speaking generally here for both a new jazz ensemble director as well as offering my thoughts to those of you running the sound from behind the board. I don’t recall exactly where I saw this, but there is a video of Wynton Marsalis discussing how the Smithsonian Jazz Masterworks Orchestra uses microphones when performing along with a symphony orchestra. In this video performance Marsalis mentions that each of the players in the SJMO get their own mic – not to make their sound louder (the symphony orchestra didn’t get miced in this way for the performance), but to bring out the nuances that each musician put into their playing that would otherwise get lost in the large room. This brings up my first point – know the room. If you’re performing in a large concert hall and have the luxury of having enough mics and channels where you can mic every individual player, then by all means go ahead and give it a shot. This is fairly impractical, however, and not usually necessary for most situations. In fact, I believe that using mics to reinforce section sound to be less desirable than using an acoustic approach to ensemble playing. I’m reminded of a couple of concerts I played a few years ago backing up Bobby Shew with the Asheville Jazz Orchestra. Bobby was brought in to be one of the featured performers at the Western Carolina University Trumpet Festival and the AJO was invited to be his backup band. The day after that performance we had asked Bobby to stick around for one more day and repeat that performance in Asheville. While the concert at WCU was in the concert hall and had sound reinforcement for us, the performance in Asheville took place in a historic church and the only microphone we used was used strictly for announcements, everything else was run acoustically. The band was responsible for handling the dynamics accordingly to ensure that soloists didn’t need to blast to be heard. Of the two performances, the concert without sound reinforcement ended up sounding better. This was partly due to us having just performed the music the night before and feeling more comfortable on it, but having to focus intensely on the dynamics and make everything work acoustically made for a more unified band sound throughout each chart. The AJO has done a number of other performances like this without sound reinforcement and as long as everyone pays attention and does their job it can work very well. That said, contemporary big band arrangements are written with solo reinforcement in mind and so I prefer to have some mics for soloists. Here is the stage plot I send out for AJO shows that shows the microphone positions. The actual placement of the mics isn’t so important (for example, in most situations I would position the trombone solo mic between the 2nd and 1st player since most of the trombone solos happen in those parts), but the key point is that there is at least one solo mic in each section. You’ll probably want two for the saxophones (one for lead tenor, one for lead alto), three if your bari player or 2nd tenor is going to blow solos too. 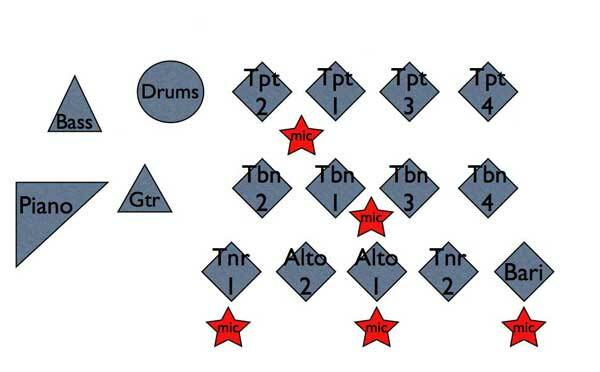 Mics will either need to be moved to different places in the section for different soloists or the players will need to switch positions for the chart. It’s important for the sound technician to understand that these mics are for solo reinforcement only. Often times the sound guy will feel that unless he has something to work with at all times that he isn’t doing his job. Frequently the tech will set up the mics like this for us and then leave them on to pick up the section sound like this. This sounds awfully strange when you get a mix of the band blending acoustically (which we work so hard to be able to do) and then have the sound of 2nd trumpet blaring through the mains. The goal is for us to be able to mix our balance as we normally play (acoustically) and then give our soloists a little extra volume so that when background figures happen the soloist doesn’t have to blast over the band and the rest of the band doesn’t have to hold back too much. This doesn’t eliminate the band’s responsibility to play sensitively with dynamics and the sound reinforcement should work in conjunction with the band’s dynamics. Savy horn players can “work the mic” a bit to help get dynamics going while soloing, provided the monitors are giving a somewhat accurate depiction of what’s coming out of the mains. As far as rhythm section sound reinforcement goes it depends a bit more on the acoustics of the room, but in general I like to have some mics on the piano for a couple of reasons. First, the pianist won’t need to pound to be heard over the band, particularly when soloing, and second it helps the soloists when we get a little piano in the monitors. Guitar and bass (or keyboard, if you’re not using an acoustic piano) tend to work best when you simply use the amp on stage and balance accordingly, but sometimes having a direct line to the board can help if the sound of the room makes those instruments disappear in the house. When playing a new room it’s helpful to start with just the amps on stage, balance them for the band to hear them, and then step out into the house to hear the mix out there and adjust as needed. Sometimes you can fix problems by moving the position of the amp, turning it slightly in one direction or raising it up, rather than feeding a line into the sound board. As far as micing the drum set I’m against it in almost all situations. Most sound technicians I’ve worked with are much more experienced running sound for a rock band than for a jazz band and they expect a big band to be similar. Again, my goal is to make everything seem like it’s purely acoustically balanced, even when a little micing is used. Out of all the instruments in the big band, the drum set has the widest range of dynamic possibilities and my favorite drummers to play with are very accomplished at balancing their sound with the horns. There’s usually no need to mic anything on the drum set and putting drums into the mains sounds unstylistic and just makes the horns have to work harder to get their sound balanced up to the louder drum sound. There are exceptions, depending on the room. One venue the AJO plays in fairly regularly has a stage setup where our drummer will end up being off in a corner and the acoustics end up muffling the sound of the drums to the point where we do end up micing the drumset, but this situation is pretty rare. Again, when you get into a new venue take some time during the sound check to have someone step out into the house and listen to the mix. The “mains” are the speakers that are directed out to the audience. Usually you want to have them positioned at the front of the stage on either side of the band and raised up on stands. Once the general volume of the mains are set the sound tech will usually only adjust the individual channels as needed. How you use monitors will also depend on the acoustics of the stage you’re performing on and the equipment you have access to. Different players will want to have different mixes in the monitors as well, and so this gets pretty quickly into a matter of personal preference. My basic request for the AJO is to have 3 monitors in front. One monitor goes by the piano and is mainly to allow the pianist to hear himself or herself clearly enough when the band is playing forte as well as help the pianist hear the soloists clearly. Position this monitor mainly for the pianist, but this monitor should also help the rest of the rhythm section. The other two monitors go on either side of the horn section and are there for the band to hear piano more clearly and so that soloists will be able to hear themselves without needing to blast. I always try to remember to thank the sound technician and ask the audience to give him or her a round of applause, but I tell the tech that if I forget that this is means that they did the best job possible. When the sound is running well for a big band the effect is that there is no sound reinforcement and you can forget completely that it’s even there. The sound technicians who understand this and who actually achieve this are rare, but when you get to work with them it’s a real pleasure. Perhaps one of the best things you can do if you find yourself in a situation where you’re involved with sound reinforcement for a big band is to become familiar with the sound of a big band on excellent recordings and to imitate the mix you hear. By far the most common complaint I have with sound technicians on my big band gigs are that they tend to mix the sound like a rock band and put too much drums and the rest of the rhythm section in the mix and the horns end up having to work harder than we need to in order to get the balance correct. As the horns play louder, the sound technician pumps up the rhythm section even more and a vicious cycle begins. Listen closely to the different levels you’ll hear in a big band recording compared to a rock band with horns and you’ll learn exactly the balance you want to achieve. I know there are some people with slightly or even wildly differing philosophies about the sound reinforcement they want for a big band, but I think my thoughts here are fairly typical and certainly stylistic regarding the overall mix. If you’ve got something to add or want to object to something I’ve written here please feel free to leave your comments below. In this advanced master class will explore various ways of improvising melodic lines that go outside the chord changes. We’ll use a basic 1-4-5 blues progression and look at 4 different ways to approach this more advanced way of playing. The general concept of playing lines outside the changes is to suspend the underlying chord progression as a basis for linear improvisation for a period of time, improvising during the suspended measures using a superimposed concept, mode or progression. In his video Frank goes through three basic techniques you can use to play outside the changes, superimposing a short melodic pattern transposed to different pitch levels a second or third apart, using different modes selected for the amount of harmonic tension over a particular chord progression, and using particular scales, such as whole tone or diminished scales, that are intentionally ambiguous. It’s a very detailed introduction to playing outside of the changes and there’s a lot of good stuff in there. It’s inspired me to go back and start working more on this aspect of my own improvisation. Take 40 minutes to watch Frank’s video and try some of these ideas out. Bob Havens was the featured trombone soloist with the Lawrence Welk Show for almost its entire run. He joined the show in 1960 (the show began in 1951 as a local Los Angeles program before going national in 1955) and he remained until the show ended in 1982. While I tend to find the music performed on this program hokey at best, it was always extremely well performed and you would be hard pressed to find better musicians. Bob Havens is no exception to that, he always played great on those shows and frequently demonstrated he could blow jazz very well too. Check out this video of Havens being featured on Basin Street Blues to see what I mean. He’s certainly playing for the audience of the program, but his improvising is very tasteful and you can hear what a great trombone player he is here. We also get a few good looks at his chops, so while you’re at it see if you can guess his embouchure type. My guess after the break. I composed Golden Triangle Overture a couple of years ago for the Mississippi State University Trombone Choir, under the direction of my friend Dr. Richard Human. Over my winter break I got the urge to put together a demo recording of it to post here. I’m playing all 8 parts on tenor trombone, even though there is one alto trombone part and two bass trombone parts, because I don’t own those instruments. Today is the first day of my spring semester of 2013. To celebrate, here’s a link dump of some very scholarly resources to start your semester off right. Conductor cards, collect your favorites. Trying to Get Good, trailer for a Jack Sheldon documentary (PG13 humor in there, you’ve been warned). Simulated Guitar String Oscillations, what happens when you video your guitar strings from the inside with a cell phone camera? Rachmaninov Had Big Hands, how is a small handed pianist able to cope? John Swana Hits a Triple C!!! and he makes it look so easy. Good luck to all students and teachers out there with your semester! We were just sitting around, talking, when I felt an intense, utterly compelling need to touch his piano. I just moved over and started playing – there was no transition, it was all at once, like I’d been doing it all my life. As it turns out, this condition is called acquired savant syndrome and there are other cases where after a head injury an individual with no particular interest or talent suddenly displays amazing artistic abilities. As you might expect for an adult to suddenly display prodigy-like talents, Amato notes that his technique is somewhat unusual. I’ve played alongside a classically trained concert pianist, who was fascinated by my technique – in some respects, I play like someone who has just started learning, in others my skills outstripped his. Read more about Amato’s story here. The University of Sydney Medical School has had this announcement about a wind and brass study they are undertaking up for a couple of years now. The purpose of this proposal is to investigate a wider research design whereby several variables that may have an effect of the performance of brass instrumentalists are simultaneously evaluated. The aim of this study is to evaluate respiratory mechanics and facial muscle activity patterns in skilled wind and brass instrumentalists, and to further assess whether posture has an effect on the functional activity of breathing and embouchure. Whenever a someone publishes something like this there are always some in the community who will call such research meaningless, but I think it’s neat to take a scientific look at what we think we know. One of the neat things about research is sometimes we learn something new that’s completely unrelated to the original purpose of the research. For example, when Lloyd Leno first began his high speed filming of trombone embouchures he was doing so to see if the lips vibrated at the same frequency of the pitch (he found they do, by the way). Along the way he was surprised that while most of his subjects had downstream embouchures, one was upstream. Another good reason do conduct research like this is because while it’s common knowledge that poor posture while playing inhibits your playing, it hasn’t been really subjected to an honest test. Research on pulmonary function, sound production and physical aspects of performance in wind players is scarce and current practice remains based on opinion of the teacher or health practitioner. . . Poor posture is frequently cited as an intrinsic risk factor leading to injuries occurring in musicians and that posture is an integral part of the mechanics of breathing for optimal performance of wind players, but there is no scientific evidence to substantiate this claim. The emphases in the above quote are mine. I would predict that this study should find that posture indeed is integral to good brass technique, I have to admit that this is merely my opinion (and that of pretty much any other brass teacher and player as well). However, I have to admit that this common knowledge is really subject to our own confirmation bias. Wouldn’t it be interesting if after all the numbers are crunched they found that posture has a negligible effect on breathing and embouchure? Or maybe breathing but not embouchure? Even should the results end up being a no brainer, there is still something that will be gleaned from looking closely at it this topic. We can learn more about how much posture should be emphasized and when to move on. When dealing with technique issues or injuries having a clear understanding will allow us to put posture into context with other mechanical issues. A scientific approach to kinesthetics and motor skill development has done a lot to improve the state of athletics, to name one example, and there’s no reason why taking a similar approach to music performance and pedagogy wouldn’t do the same. While the music field tends to have a passing interest in this sort of research at best, I think we limit the tools of trade by doing so. Here’s something interesting I recently came across. The Stratos embouchure trainer. It purports to to help you, “adapt your embouchure to get the best from your newly-adjusted jaw position.” Here’s the inventor, trombonist Marcus Reynolds, explaining it. I have to admit going into the video that I was a little skeptical of the claims right off. Early on he makes a statement that the Stratos will eliminate a “red ring,” but a red ring in and of itself is a meaningless indicator of how much or little pressure a player is using. There’s too much individual variation here, but for some reason this myth is prevalent. He also discusses air stream direction as a matter of jaw alignment, which probably does have some influence, albeit a minor one. Air stream direction is dependent on the lip ratio inside the mouthpiece and you can have downstream players with a jaw position forward, like Reynolds is advocating, or upstream players with a receded jaw position. My next point of contention is Reynolds apparent endorsement that getting the jaw forward and the horn angle up is best for everyone. It’s true that this is common, but not universal. Personally, trying to raise my horn angle and get my jaw position forwards has had very poor results, I simply play better with a receded jaw and a lowered horn angle. Not having tried out the Stratos, I can’t say that my results trying this would be the same or different, but I’ve taught too many other students and seen other players who also play best with a lowered horn angle to think that a Stratos would be helpful for these players. However, there are a lot of players who would do better with the jaw position and horn angle that the Stratos apparently encourages. For these players, this device might be a very helpful practice aid. Since it’s adjustable, it might even be possible to alter the angle of it and use it for correctional procedures with players who don’t want their jaw position aligned. I don’t think it’s the panacea that Reynold’s seems to think it is, but it’s an interesting idea and it’s worth a closer look later. I was recently asked if I could clarify Donald Reinhardt’s thoughts on the position of the lower lip while free buzzing. Rather than paraphrase it again, here is the direct quote. The membrane (red) of the lower lip must be rolled in (not curled in) and slightly over the lower teeth, while the tip of the overlapping upper lip is simultaneously reaching down to make its light contact (just touching) with the lower lip at the vibrating points. One specific question was what Reinhardt meant by “roll” and “curl.” My interpretation is that the inner membrane of the lower lip shouldn’t be stretched up and over the lower teeth (curl), but rather the vermillion (red) of the lips rolled in to contact the top of the lower teeth. While the vermillion is capable of accepting pressure pretty well, the inner membrane isn’t. Curling your lip over your lower teeth would position the inner membrane over the top of your lower teeth, while rolling the lip encourages placing vermillion slightly over the top of the lower teeth. Whether or not this was Reinhardt’s reasoning, I don’t know. There may also be a difference in what specific embouchure muscles are targeted that Reinhardt felt was optimal, but as far as I know he never wrote about or described his reasoning to any students. Another concern was whether my paraphrasing to roll the lower lip “in towards” rather than “over” the lower teeth makes for a noticeable difference. In my opinion, any description of free buzzing is designed to get the player heading in the right direction and that adjustments are made as needed. Reinhardt crams a lot of detail into that one sentence and I find it a little unwieldy and sometimes unnecessary to explain free buzzing that way. I’ve had some success by telling students, “Think of your lower lip gently hugging your lower teeth, now bring your top lip down as if you’re saying ’em’.” Sometimes that doesn’t do the trick and I need to describe it differently. I also think that depending on what a student is capable of, it may be best to intentionally deviate slightly from the exact description, so long as the correct muscles are targeted (mostly the muscles that intersect at and just under the mouth corners). Sometimes I’ll have the student roll so there’s more lower lip over the lower teeth, sometimes less. So whether you prefer roll “in towards” or roll “over” the lower teeth, keep the inner membrane of your lower lip off the lower teeth and you probably will be fine to get started with free buzzing. In my opinion, the two most important things to remember while free buzzing is to go for a mosquito-like sound as much as possible – soft, thin, airy, and high pitched at first, and keep in mind that all you really need to do is a little bit of free buzzing. Free buzzing as Reinhardt describes is strenuous enough that you probably only need a couple of minutes a day at first. This is an exercise that many other instrumentalists use, not just trombonists. I know several band directors who use this as a warm-up for their middle school or high school concert band. I use variations on this exercise to teach and practice slide technique. I change it in three ways to focus on slide technique: by expanding it so that it works all 7 slide positions, by using no tongue except for initial attacks, and by altering the pattern to ensure that breaths are taken optimally. Play the F in 6th position and the E in 7th, so that you’re practicing moving the slide from 1st out to every other position and then back to 1st again. The extra Bbs are to ensure that you don’t use the breaths as a way to avoid moving the slide quickly and smoothly at any point. Another excellent way to get feedback on the slide technique is to only tongue after the breath marks and without backing off on the air (blow through the slide changes), try to make each note change have as little gliss as possible while still being relaxed and not too jerky with the slide movement. After playing through it once this way add a light legato tongue to each note change to smooth out the legato. Another variation you can try is to transpose the exercise starting on any other 1st position note. Simply use the exact same slide positions (altered for intonation according to whatever partial you start on). I’m a big believer in the idea that it’s not so much what you practice that is important, but how you practice it. With a particular goal in mind and a little creativity you can take a lot of things and alter them in ways to target your particular weaknesses. I got the ideas for the various alterations from a variety of different teachers or books and simply applied them to a different exercise. What’s one of your current practice goals and what are you practicing to address them? Can you think of ways of altering other materials that you already know in order to specifically target your goal?